Model: AIE-100T, 200, 300, 400P, 500, 205, 305,405. 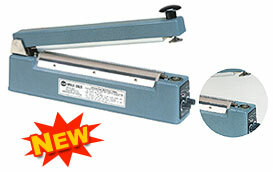 This extra long 24 inches Impulse Sealer enables the user to seal packages without having to lift them. It comes equipped with a round element wire for sealing and trimming, a sealing timer and a carrying handle for portability. Sturdy lightweight steel construction. This portable, tabletop impulse sealer has the ability to seal with ease. 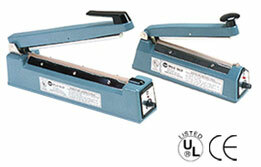 The impulse sealer comes complete with dual timers, one for heating and one for congealing. A built-in magnet holds the sealing arm down during the heating cycle and then releases it automatically once the cooling cycle is complete. The sealing widths available for this unit are 2-millimeter or 5-millimeter. Seal Length 4 " 8 " 8 " 12 " 12 " 12 " 12 " 16 " 16 " 20 " 24 "
Included with all our Hnad Sealers is a 6 Piece Relpacement Parts Kit (2 Heating Elements, 2 Upper Teflon & 2 Lower Teflon).